Giant panes of glass form the walls of this triangle-shaped maze at The Nelson-Atkins Museum of Art in Kansas City by artist Robert Morris. American artist and sculptor Robert Morris designed the outdoor labyrinth as a six-month-long interactive installation in the Donald J. Hall Sculpture Park at The Nelson-Atkins Museum of Art. The inch-thick plates of glass are capped with bronze rails around the top. Access to the maze is via a paved red brick pathway on one side of the structure. Unlike traditional mazes that obscure the views around, visitors manoeuvre their way through this completely transparent installation to reach the end point: a small triangular section at the centre. "The idea of a labyrinth as a place in which we lose ourselves in order to find ourselves is intriguing," said Antonia Boström, the museum's director of Curatorial Affairs. "This sculpture encompasses many things: engagement, participation, a spirit of theatricality, and also pushes boundaries between an art object and personal experience." Robert Morris, who was born and raised in Kansas City, credited many of his childhood visits to the museum as formative experience for this artwork. His maze opened on 22 May. Other mazes we've featured on Dezeen include this curvy labyrinth in Copenhagen and a wooden structure at the National Building Museum in Washington DC. Photography is by Josh Ferdinand. A triangular-shaped, glass-walled labyrinth designed by acclaimed artist and Kansas City native Robert Morris is being installed in the Donald J. Hall Sculpture Park at The Nelson-Atkins Museum of Art. This dynamic sculpture will provide visitors with an intimate experience, enticing them to interact with the art by winding through the glass maze. The installation of Glass Labyrinth in the southeast section of the park marks the start of a six-month long celebration of the 25th anniversary of the Donald J. Hall Sculpture Park. The 62-foot by 62-foot by 62-foot, seven-foot-tall labyrinth, which weighs more than 400 tons, will be fully installed on May 22, when a public celebration will be held. Robert Morris is an American artist who contributed significantly to the development of several art movements during the 1960s and 1970s, including Minimalism, Process Art and Earthworks. Historically Morris has rejected traditional concepts of art while focusing heavily on the relationship between the artwork and the viewer. "It is fitting that we kick off our celebration of the Donald J. Hall Sculpture Park with this exciting new museum commission that has been made possible through the generosity of the Hall Family Foundation," said Julián Zugazagoitia, Menefee D. and Mary Louise Blackwell CEO & Director of the Nelson-Atkins. "Through the years, this oasis of green space has continually evolved as a place of both activity and quiet inspiration in which visitors can enjoy an incredible collection of art." "The idea of a labyrinth as a place in which we lose ourselves in order to find ourselves is intriguing," said Antonia Boström, Director, Curatorial Affairs. "This sculpture encompasses many things: engagement, participation, a spirit of theatricality, and also pushes boundaries between an art object and personal experience." In the late 1960s, Morris helped start the Process Art movement and began using industrial materials for sculptural works. He used aluminium, steel, felt, string, mirrors and dirt to create transient works of art like Continuous Project Altered Daily, 1969. His felt series is a stunning example of the beauty he found in these unexpected and unconventional media. Morris, who has credited childhood visits to the Nelson-Atkins as formative experience for his art, progressed naturally into the art of sculpture because of its interactive possibilities. His continued curiosity for the opportunities of viewer participation led to the creation of his Labyrinth series. 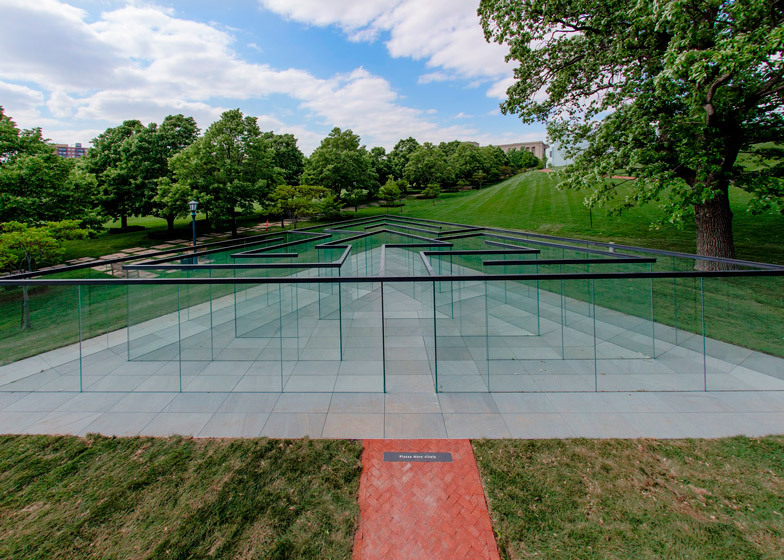 Glass Labyrinth is the first permanent Robert Morris labyrinth installed in the U.S. These installations permit the viewer to experience his art from the inside out through the navigation of the piece. Glass Labyrinth will take this idea even further by allowing visitors to simultaneously encounter his art and the Sculpture Park through its transparent glass walls. While the labyrinth is a deceptively simple structure, its creation required a very large team and much ingenuity to see its realisation. Construction began on the project last fall, under the leadership of Steve Waterman, Nelson-Atkins Director, Presentation and in collaboration with Erich Blohm Design, engineer for Robert Morris. A crew of more than 80 worked on the physical construction of the sculpture, with an additional crew of local and national companies involved in the planning and development. "Robert Morris was born in Kansas City," said Waterman. "Building his vision with the stonemasons, bronze fabricators, glass glazers and engineers of his own city creates an even deeper participatory element in a piece that already beckons it. We're thrilled to have it on our front lawn." The project was funded through a generous gift of The Hall Family Foundation. Engineering, construction and installation for the project was provided by Erich Blohm Design, McCownGordon Construction, Livers Bronze, JEI Structural Engineering, BSE Structural Engineers, Rick Howell Landscape Architecture, W Carter & Associates Glazing, Structural Engineering Associates, BNIM, Builders Steel Company, Carthage Stoneworks, Electrical Corporation of America, Knight Trenching & Excavating, Musselman & Hall, Westland Landscape and Terracon.